Since I received my iPod Nano 4GB (1st gen), the included earbuds stayed packed in the box. For years I’ve preferred Sony’s in-ear-sideways-based headphones. The cord on my favorite white Sonys started to fray, so I decided to give the Apple earbuds a shot. After slipping on the foam and snugging them in, I have to say they’re not too bad. I’ve listened to a little bit of music on them and might have stronger opinions if that’s all I listened to on them. However, I still use the Nano for podcast listening 95% of the time, so the earbuds will be fine. 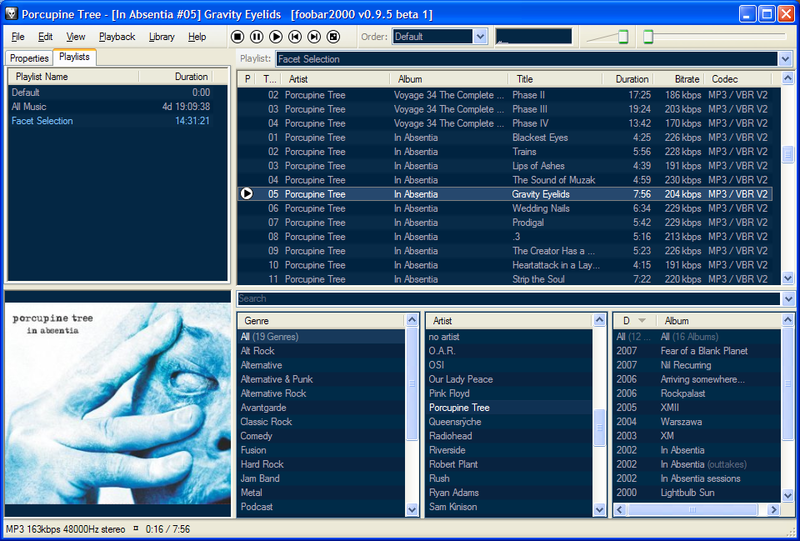 I haven’t been this pleased with Foobar 2000 in a long time. The default user interface (UI) in 0.9.5 has been significantly upgraded, with integrated support for things like album art, autoplaylists, and themes. I’m already tweaking out a new config that uses the default UI combined with the Facets plugin I linked to before, changing away from Columns UI after using it a few years and dabbling in the Panels UI a little. Update: Added a screenshot of my current config. Update: I’m going to try this adapter since one of the reviewers said specifically that it worked with their camcorder under XP x64 using WinDV. Beta and VHS were physically different media formats that could not be played by the same player. Dual-format media and dual-format players (which I’ve advocated for two years) along with the PlayStation 3 will keep both Blu-Ray and HD-DVD in the marketplace. Would adoption occur quicker if there were one format? Sure. But it’s not necessary. I linkblogged the Wired article that purports that the majors are going to consider selling unprotected MP3s with watermarking technology. I support this. I’ve long felt that users should be trusted with unencumbered content. This move would go a ways towards making mainstream music consumption friendlier, but there are still the Catch-22’s of the cases of broken media (did I buy that plastic disc, or did I buy the right to listen to that content?) and copy-protected CDs versus music CD-R/Minidisc tax (I paid your stinking tax, now why can’t I legally transfer the music to taxed media?). My mother-in-law, Linda, gave me Neil Peart‘s Roadshow: Landscape With Drums: A Concert Tour by Motorcycle, which I’m reading now. I love Neil’s books as much as I enjoy his drumming and lyrics in Rush. Highly recommended for new BMW motorcycle owner Jonathan. Melissa gave me iWoz, Steve Wozniak‘s bio. Should be a fun read; I’ve enjoyed Woz when I’ve heard him on podcasts over the past few years. Melissa also gave me Superman II – The Richard Donner Cut, which is highly recommended by fellow BDFLer Andy Bolin. I’m looking forward to seeing this; I haven’t seen the original in at least a decade. 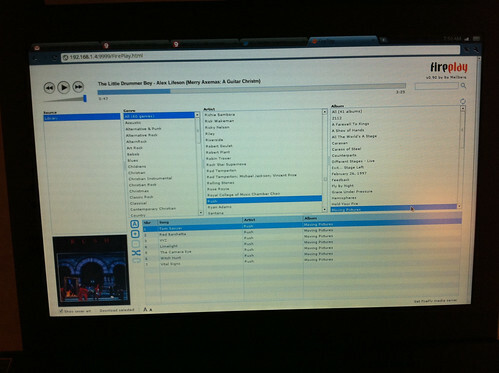 Melissa surprised me with the remix single “re: free” from OSI; well, it was on my wishlist! I dig all the OSI/Kevin Moore stuff I’ve heard, and this is no exception. Why is it that kids pick the week before Christmas to act up the most? We’re having to have a “strict” day with Ryan today before what we are hoping is a joyful and relaxing Christmas week. I usually have a few Porcupine Tree CDs in my car’s changer and I use them to “charge up” before work. Since it’s just a 10-minute drive, I usually have time for one or two songs. One of the songs I’ve discovered I have more appreciation now than when I first heard it is “Prodigal” from In Absentia. I’m going to totally learn that on the bass, even the syncopated part at the very end of the song. Steven Wilson’s outro solo is very Lifeson-esque, and it gets me air-guitaring every time. Speaking of bass, I’ve been wanted to pull the trigger on a bass switch; my old Hamer Slammer Series Chapparral 5-string for a new Fender Geddy Lee Jazz (or possibly the Squier Modified 70’s Jazz). I haven’t tried to trade anything in to Guitar Center yet, so I’m a little nervous. What I definitely haven’t had the nerve to do is to make the switch before Christmas. This self-indulgence can wait. My 5-string Ibanez SR1205 is still in great shape and is my main ax. My enthusiasm in improving ICYG is stagnating. Every time I think I’ll sit down and code the ultimate playlist-generating Python library, I feel I’m not up to the task. I’m actually thinking seriously about building a small-form-factor Linux box for various media-serving, though I doubt I’ll find a stream renderer that suits me more than my current Foobar2000/Oddcast combo. Update (12/30): The Hamer bass I mentioned is for sale.